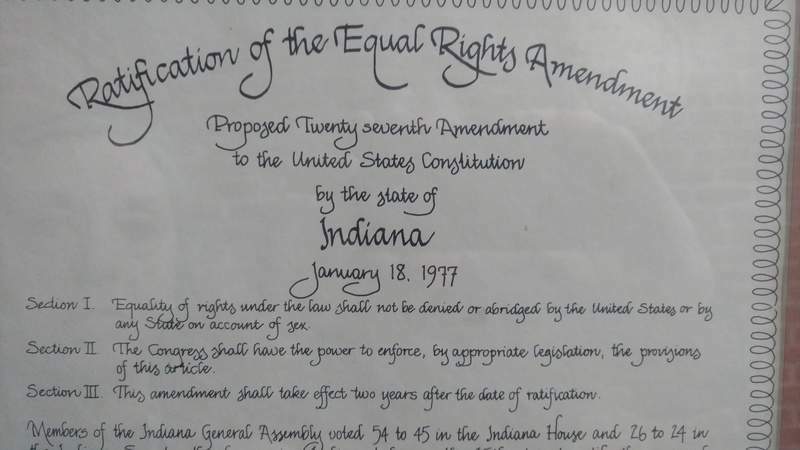 Courtesy photo The text of the proposed Equal Rights Amendment amendment to the U.S. Constitution is shown on a plaque commemorating Indiana's adoption of the language in 1977. The Illinois Senate voted 43-12 Wednesday to ratify the Equal Rights Amendment. Its prospects are said to be uncertain in the House, but if it passes there, Illinois would become the 36th state to approve the ERA. Thirty-eight states must concur if an amendment is to become part of the U.S. Constitution. But in this case, making the ERA the law of the land is even harder than finding two more states to ratify it. The deadline for reaching the 38-state goal was in 1982. Supporters say Congress should be willing to waive the deadline in this #MeToo era. In February 1973, the amendment passed the House 53-45, but four years later, it still hadn't passed the Senate. On the morning of Jan. 18, 1977, the Senate was split 25 to 25, the Star recounted. But Sen. Wayne Townsend, a Hartford City Democrat, agreed to change his vote after receiving a phone call from President-elect Jimmy Carter and his wife, Rosalynn. The amendment passed 26-24. Will the “time's not up” movement gain traction? Stay tuned.